Product Name: FILORGA ART FILLER UNIVERSAL with Lidocaine. Accessory: Four 27G x 1/2” (0.4 x 13 mm) needles, four traceability labels, packaging insert. 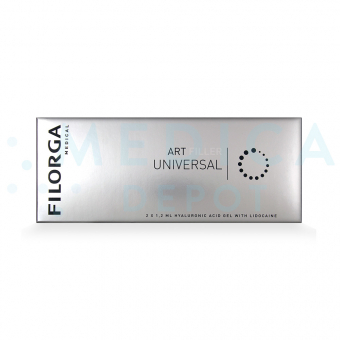 What is Filorga ART Filler Universal with Lidocaine? 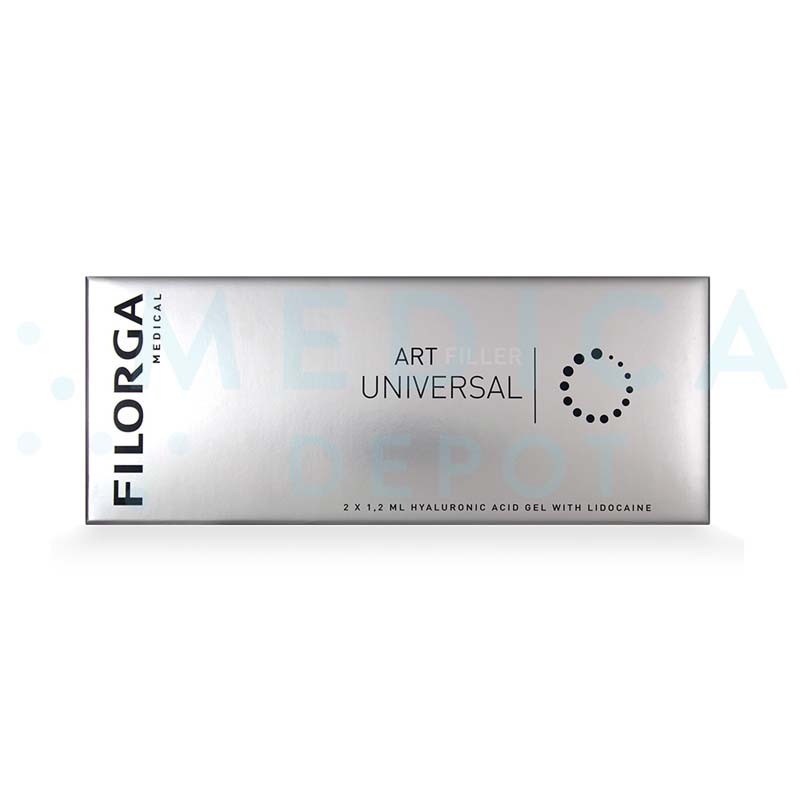 Filorga ART Filler Universal with Lidocaine is a dermal filler made with hyaluronic acid, with Lidocaine for anesthetic pain relief. Doctors inject this filler to correct medium to deep wrinkles while boosting collagen and elastin synthesis for improved skin texture. Like many dermal fillers, this gel is made of hyaluronic acid, but Tri-Hyal technology creates a gel that is flexible and moldable for a naturally-sculpted look. You may be able to buy this hyaluronic acid filler from your local Filorga distributor, but you can also buy Filorga ART Filler Universal with Lidocaine online from Medica Depot. Enjoy the convenience of purchasing this and other aesthetic products online while benefitting from low wholesale prices when you buy one or one hundred. Buy this and other genuine brand-name dermal fillers online, by phone, or by fax. When you buy one package, you will receive two pre-filled syringes of hyaluronic acid and Lidocaine gel, four 27G x 1/2” needles, four traceability labels, and one product leaflet. 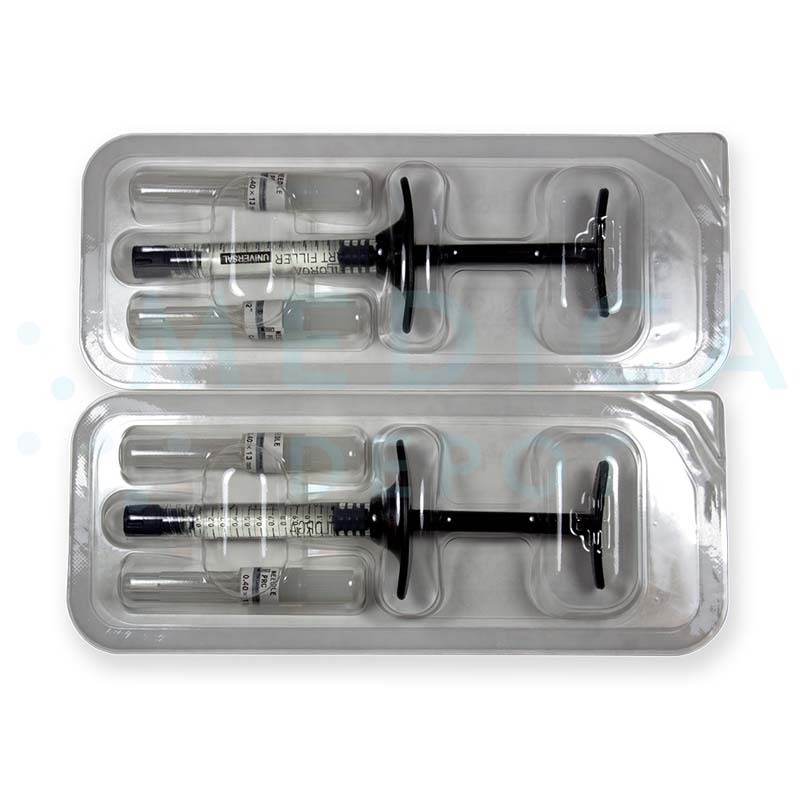 Genuine, brand-name injectable from Filorga, an innovative French cosmetic brand. Contains Lidocaine for improved treatment comfort. Tri-Hyal technology blends different hyaluronic acid types to create a gel that is moldable for more natural-looking results. Lasts eighteen months after one initial and one touch-up treatment. How does Filorga ART Filler Universal with Lidocaine work? This injectable gel is made of hyaluronic acid, created with Tri-Hyal technology. This technology blends three different hyaluronic acids with three different correction types: sculpting, volumizing, and smoothing. When you inject the hyaluronic acid into your patient’s dermis, the molecules hold moisture to restore volume, supporting the skin’s surface to smooth the look of wrinkles. The special blend of hyaluronic acid creates a moldable gel, so after injection, you can sculpt the gel to the desired shape. In addition to adding instant volume to skin, the hyaluronic acid stimulates collagen and elastin synthesis. This increase in collagen and elastin fibers helps restore structure and elasticity to skin for greater resilience. The dermal filler also contains Lidocaine, an anesthetic that helps reduce needle pain during treatment. 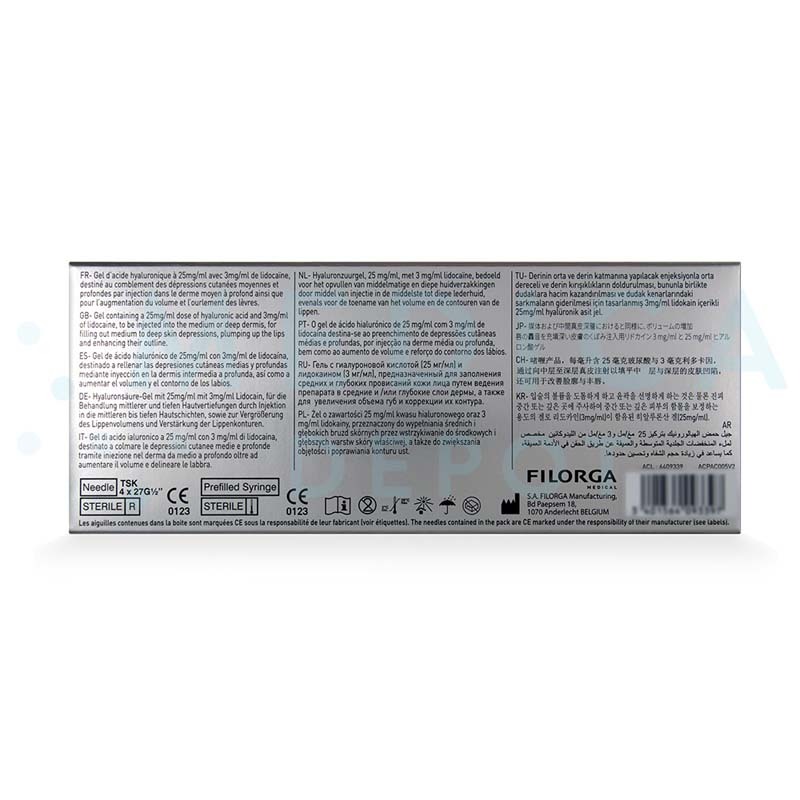 What are the ingredients in Filorga ART Filler Universal with Lidocaine? This dermal filler contains hyaluronic acid along with Lidocaine for improved comfort during injection. What is the difference between Filorga ART fillers and other hyaluronic acid fillers? Hyaluronic acid is a popular dermal filler ingredient because of its hydrating and volume-creating properties. However, there are different types of hyaluronic acid gel with different consistencies. In the case of Filorga ART fillers, the gel contains three different types of hyaluronic acid gel to combine its sculpting, volumizing, and smoothing properties for a gel that is moldable for natural-looking results. Inject this gel into the into the middle to deep dermis, or the mucus membrane of the lips, using a 27G 1/2” needle, following proper aseptic techniques. After injection, you may lightly massage the area to ensure the gel is evenly distributed. After the initial injection, administering a touch-up treatment at nine months helps maintain about eighteen months of correction. Your patients should have another treatment at that time if they want to extend their results. With an initial injection plus a touch-up treatment, results should last about eighteen months. You can use this hyaluronic acid filler to correct medium to deep facial wrinkles or to increase lip volume and enhance the lip outline. Who is an ideal candidate for Filorga ART Filler Universal with Lidocaine treatments? The ideal candidate for these treatments is a patient who has moderate to more severe signs of aging, such as medium to deep lines and facial creases. These injections can help restore dermal volume to smooth the look of wrinkles while improving skin texture. Why should I purchase Filorga ART Filler Universal with Lidocaine? Purchase this cosmetic filler to correct the appearance of moderate to deep wrinkles and creases while stimulating collagen and elastin synthesis for improved skin texture. This filler is made by Filorga, a French brand known for its innovative aesthetic products, so you and your patients know you can count on this dermal filler to provide quality results. Since this filler contains Lidcoaine, treatments are more comfortable for your patients while saving you the time and hassle of mixing in or using your own separate anesthetic. 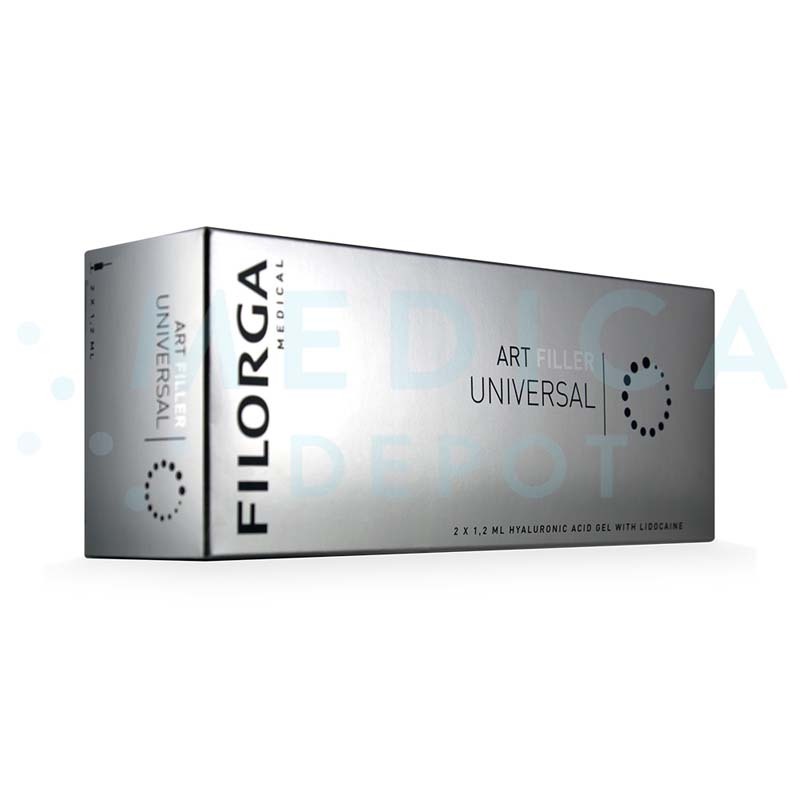 Most of all, by purchasing Filorga ART Filler Universal from Medica Depot, you save money with low wholesale prices. What are Filorga ART Filler Universal with Lidocaine’s side effects? Skin discoloration in the injection area. Poor filling effect or effectiveness. Rarely, glabellar necrosis, abscesses, granuloma, or immediate or delayed hypersensitivity. Side effects usually resolve within about a week. These may not be all the possible side effects.